Home > Health Care, Food, Beer, Retail, Tobacco > Medical, Health Care, Drugs > Physicians Pharmaceutical Services, Inc. 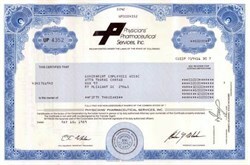 Beautifully engraved certificate from the Physicians Pharmaceutical Services, Inc. issued in 1989. This historic document was printed by the Security - Columbian United States Banknote Company and has an ornate border around it with a vignette of the company logo. This item has the printed signatures of the Company’s President and Chairman ( Andrew J. Whelan ) and Vice President, Secretary Treasurer and is over 14 years old. Andrew J. Whelan, President, a seasoned business executive with a strong financial, consulting and management background was the founder, Chairman and President of Physicians' Pharmaceutical Services, Inc., a public company and a charter member of the Maryland Chapter of ``Inc's Fastest Growing Companies in America.'' Physicians' Pharmaceutical Services, Inc. was a packaged prescription pharmaceutical manufacturer.